“I became a minister according to the stewardship from God … to make the word of God fully known, the mystery hidden for ages and generations but now revealed to his saints” (Col. 1:25-26). Mystery religions that promised salvation to a select group of initiates who received the mysteries — top-secret teachings — of certain religious figures were common in the ancient Greco-Roman world. During the early part of the twentieth century, many historians claimed that Christianity merely co-opted the beliefs of these mystery religions for its own purposes, eventually winning more adherents than any other group. 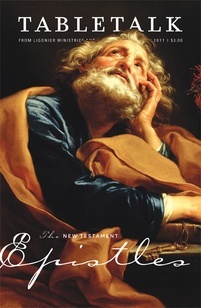 Such theories were proposed largely on account of Paul’s use of the term mystery in Colossians 1:25–26 and many other passages. Though these theories are still found in many popular-level attacks on the Christian faith, such ideas were debunked long ago. Better historical research proves that the mystery religions borrowed from Christianity, perverting its rituals and teachings to make them compatible with rank paganism. Moreover, it is astounding that anyone could think that the other apostles simply adopted the mystery religions for their own purposes, for the meaning of the term mystery is far different in the New Testament than it was in the surrounding society. Instead of a secret truth that only the “truly spiritual” can understand, mystery in the Bible refers to something that was once unclear under the old covenant but is now seen plainly under the new covenant. Such mysteries are given to all the saints of God, as we see in today’s passage. We will look at the specific mystery Paul introduces in Colossians 1:25–26 more tomorrow, but for now note that it has to do with the full citizenship of Gentiles alongside faithful Israelites in the kingdom of God (see Eph. 3:6). What we want to stress today is that this mystery, along with every other so-called “mystery” in Scripture, can be grasped by all believers. To be sure, it will take an eternity to plumb the depths of God’s revelation; however, there is no secret teaching that is the possession of merely a few believers. In the body of Christ there are no racial, gender, or economic distinctions before God when it comes to the truth — all have a share in learning and understanding what has been given to us in His Word through the inspiration of the Holy Spirit (Gal. 3:27–28; 1 John 2:27). Undeniably, some people are more gifted teachers of these mysteries than others, just as was true under the old covenant. But there is no hidden truth in Scripture that belongs to only a few. Throughout history, there have been many groups and individuals who have claimed that God has revealed truths only to them and that only they can understand the will of the Lord. The true God, however, has revealed Himself in His inscripturated Word, which is available to all people. We should not think that it will be forever impossible for us to understand any part of the Scriptures, for we trust the Spirit to illumine our understanding.